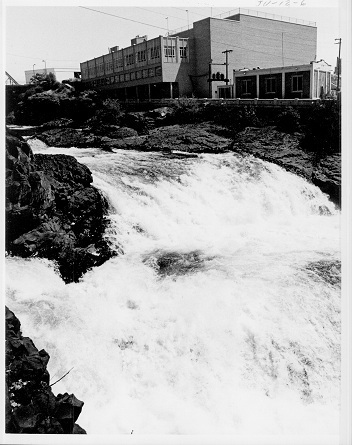 The Spokane River gorge has undergone many transformations in the last century. 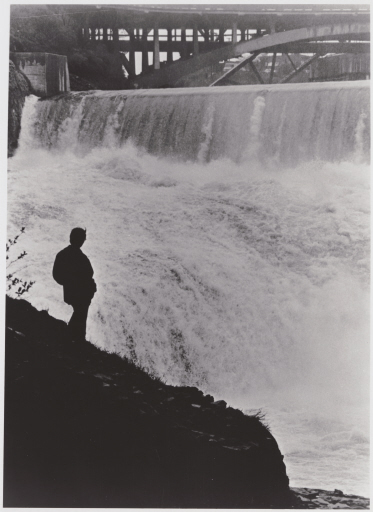 Don't be distracted by the roar of the falls; look at the riverfront. 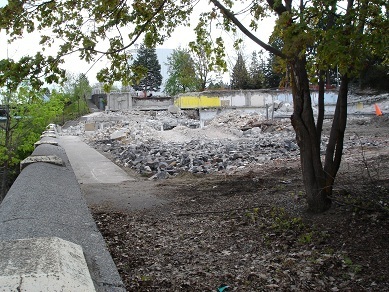 Until 2011, the trees, shrubs, and concrete remnants you see here were the former YMCA headquarters. 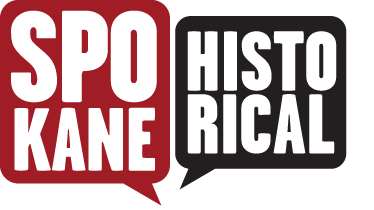 While that is not long ago, they are part of a story that began at the turn of the 20th century. In 1914, the Board of Parks Commissioners hired the Olmsted Brothers, sons of journalist and landscape designer Frederick Law Olmsted, to outline a plan for the city's parks. Their report called for four large parks to help calm the "continual strain of the nerves" among urban dwellers caused by the "multitudinous harsh noises and the vivid and eye-tiring sights" of the city. 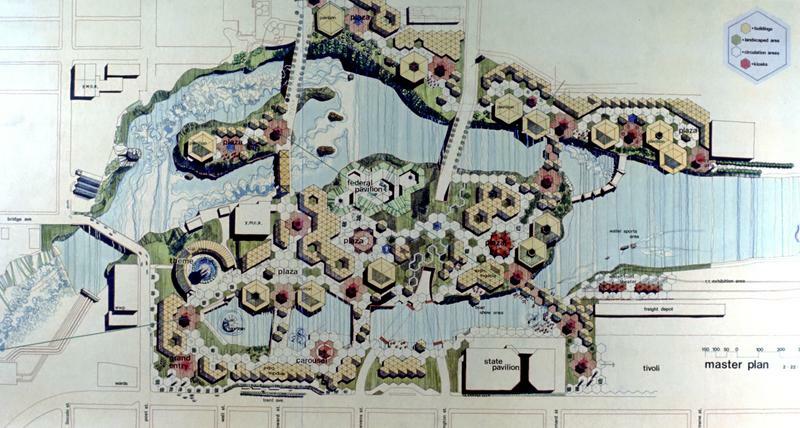 The centerpiece was a proposed Gorge Park, where in the face of continuing industrial construction, the brothers urged the city to "preserve what beauty and grandeur remains of its great river gorge." 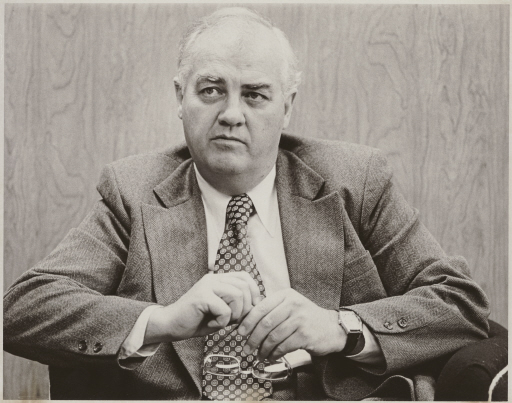 Unfortunately, their ideas would be buried under another fifty years of commercial development. 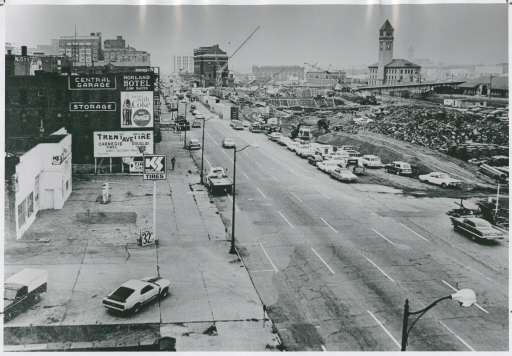 By the mid-1960s, the Park Board and Plan Commission began to call for "appropriate riverfront development, including landscaped areas, vistas, commercial recreation, cultural facilities, public buildings, parks, zoos or zoolets, river drives and paths, and encouraging appropriate offices and business establishments and apartments" along with "the removal of railroad trackage" from the riverfront and Havermale Island. At the same time, the YMCA of the Inland Northwest purchased land and built a new home on the northern edge of the island. 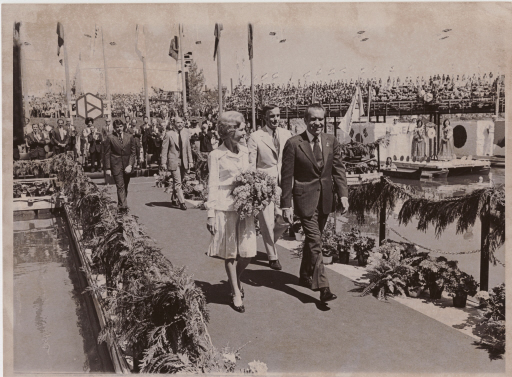 The vision of both the Park Board and the YMCA soon merged with the urban renewal plans of Expo 74. Its theme: "Celebrating Tomorrow's Fresh New Environment." 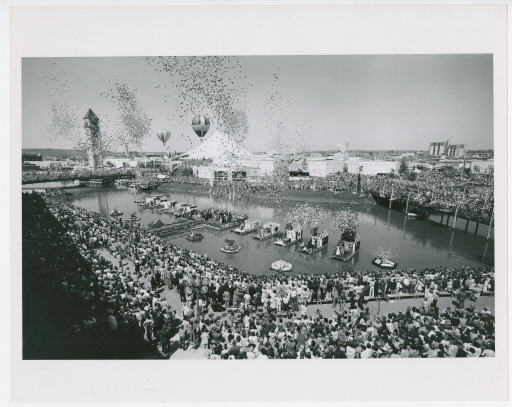 The six-month festival brought 5.6 million people to Spokane, and its physical legacy includes Riverfront Park, the Spokane Convention Center and the INB Performing Arts Center. 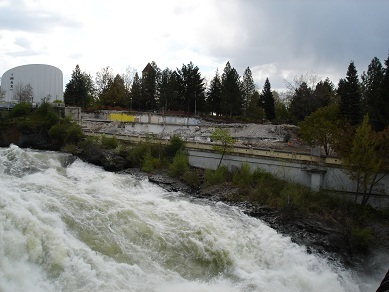 Expo '74 also restored access to Spokane's falls and gorge, breathing new life into the 1908 Olmsted park plan and reflecting a national trend of rediscovered urban waterfronts. When the exhibitors left, the Park Board transformed the Expo grounds into the natural and artificial landscapes of Riverfront Park. The YMCA building had worked double duty as the fair headquarters and was now surrounded by saplings and lawns. In 2006, as the YMCA prepared to move to a new location north of the river, they placed the building in Riverfront Park on the market. Developer Mark Pinch arranged to buy it in order to build a 14-story condominium tower, which he compared to San Antonio's Riverwalk. The city had right of first refusal but struggled to cobble together funding during the recession of the late 2000s. Proposals and counterproposals flew, ranging from turning the old building into a museum to using it as office space to allowing Pinch to buy it. Finally, during the spring and early summer of 2011, fences surrounded the site and backhoes and jackhammers pounded concrete. The building wasn't being removed for office space, a museum, or a tower but for trees and shrubs to match those across the channel. Park visitors will one day be able to stand in a green tunnel opening to white water and black basalt. 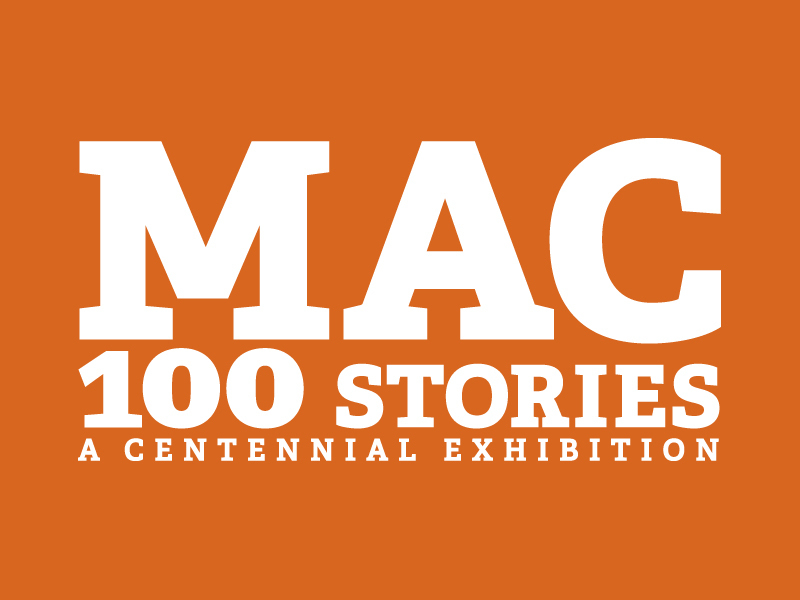 Spokane Historical presents 15 regional and city tours in partnership with the Northwest Museum of Arts & Culture and its 100 Stories exhibition. 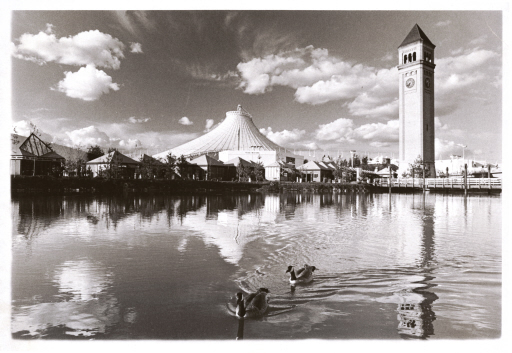 Riverfront Park on May 15, 1974: The Great Northern Railroad Clocktower stands tall as a icon of Spokane's industrial past against a backdrop of the modern U.S. Pavilion at Expo '74. Today both remain in the park reminding visitors of the past lives of Riverfront Park. Image L2002-33.36 courtesy of the Northwest Museum of Arts & Culture. 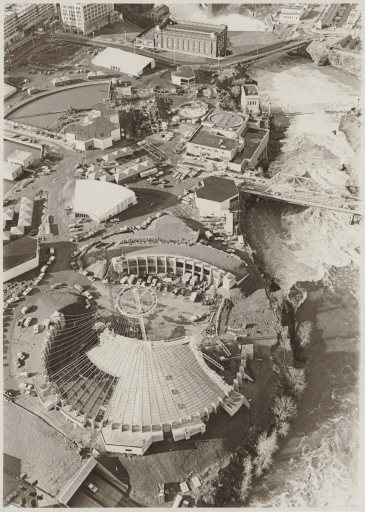 Construction: While many of the buildings seen here have now been torn down or re-purposed, the U.S. Pavilion remains today one of Riverfront Park's iconic structures. Image L2002-33.6 courtesy of the Northwest Museum of Arts & Culture. 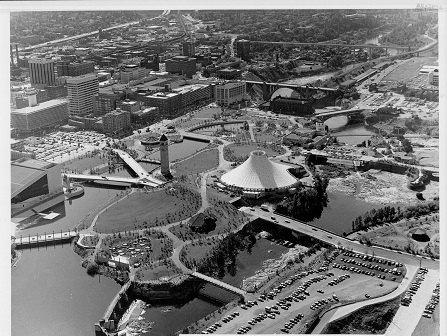 Aerial View of Construction: Taken before Expo '74, one can see the transformation of the former industrial heart of the city into a park. Image L2002-33.101 courtesy of the Northwest Museum of Arts & Culture. 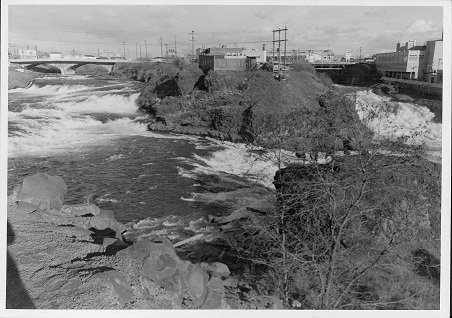 Spokane's Lower Falls, 1974: The natural beauty of Spokane's Falls was a major natural feature that was highlighted during Expo. The falls remain a main attraction at the park today. Image L2002-33.49 courtesy of the Northwest Museum of Arts & Culture. 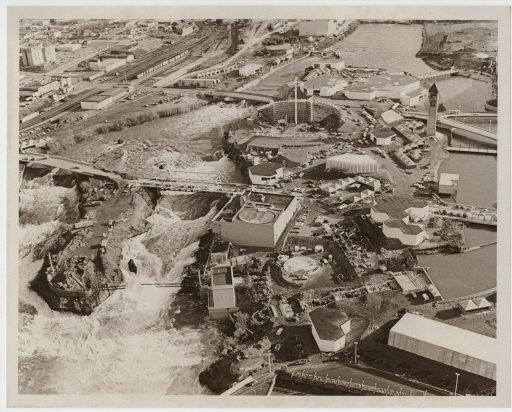 The Falls, 1974: One of the main attractions at Riverfront park is the Spokane Falls, seen here against a backdrop of the structures of the World's Fair in 1974. 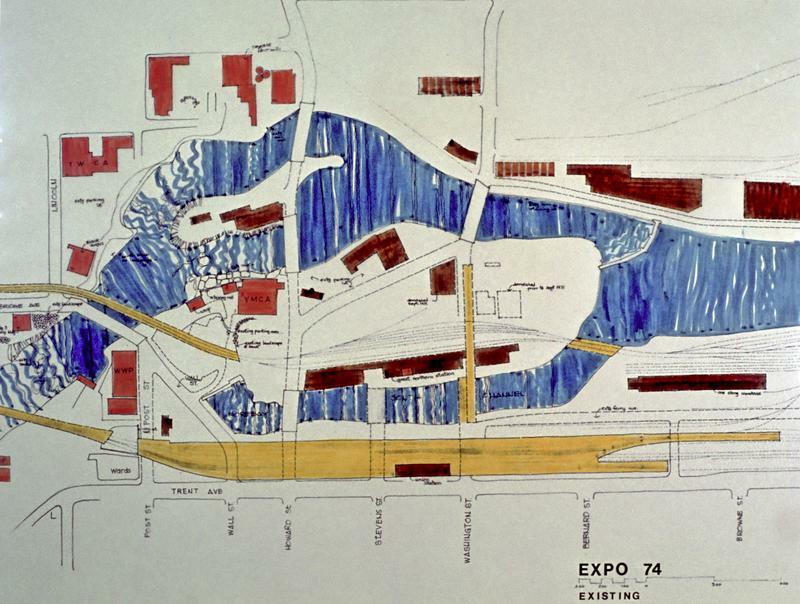 Clayton Hanson, “Expo '74 and the Creation of Riverfront Park,” Spokane Historical, accessed April 21, 2019, https://spokanehistorical.org/items/show/75.